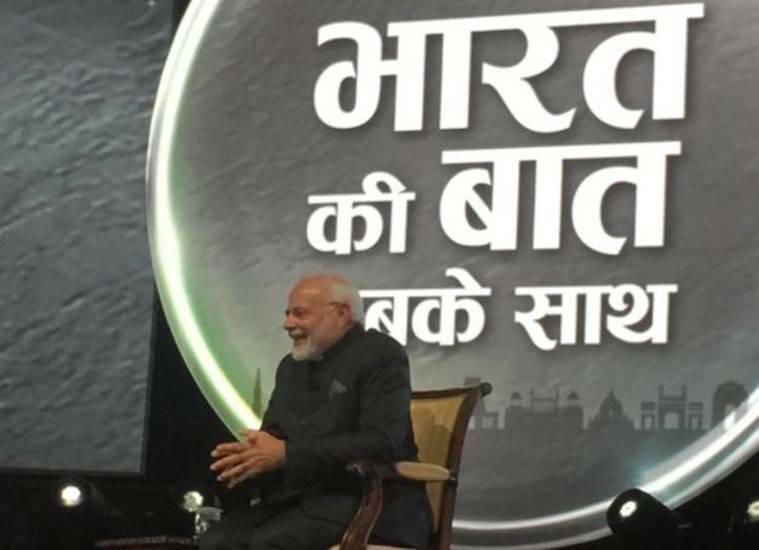 Bharat Ki Baat, Sabke Saath: Prime Minister Narendra Modi answered questions from people of the Indian community at an event in London. Prime Minister Narendra Modi is ending the first day of his London visit by interacting with Indian diaspora at a mega event titled “Bharat Ki Baat, Sabke Saath”. Modi is answering questions asked by people from Indian community at the event being organised at the iconic Central Hall Westminster. The event started at 9 pm India time. According to reports, over 1000 people are present at the venue. Questions are also sourced from Facebook, Twitter and the NaMo app. Earlier in the day, Modi held a meeting with his British counterpart Theresa May. The prime minister told May that there would be no dilution in the importance of the UK to India after it leaves the EU, as the two leaders agreed to infuse new energy into bilateral ties post-Brexit. The two leaders had “fruitful discussions” on multiple aspects of India-UK relations and issues like counter-terrorism, radicalisation and online extremism, according to official statements. Modi, who arrived at 10 Downing Street for a breakfast meeting, was greeted with the customary handshake by May. “Very welcome to London, Prime Minister,” May said as she greeted Modi. “Wonderful meeting with Prime Minister @theresa_may at 10, Downing Street. We had fruitful discussions on multiple aspects of India-UK relations,” Prime Minister Modi tweeted after the meeting. Speaking on being asked about his views on the criticism, PM Modi says he has no problem with criticism and that democracy cannot succeed without constructive criticism. "It makes democracy strong, I want government to be criticised," he says. "My problem is not against criticism. To criticise, one has to research and find proper facts. Sadly, it does not happen now. What happens instead is allegations," he adds. The power of Indian passport has changed. "People look with respect when they know you are India as per your passport. India today has been able to carve a place for itself," says PM Modi. It took 70 years for the first Indian Prime minister to visit Israel. "What prevented Indian Prime Ministers from going to Israel. Yes, I will go to Israel and I will even go to Palestine," says PM Modi. I will go to Saudi Arabia and strengthen cooperation with them, and also engage with Iran for Indias's energy needs, he adds. Karan Preet Singh asks: You have become a role model for all the young Indians. You work hours a day. Where do you find such energy to keep you going? 'I am able to digest 1-2kgs of gaali (abuse) every day, I never get tired,' jokes PM Modi. He says that 1.2 billion people of India are part of his family and he wants to serve them well. Health is the greatest wealth anyone can have. I aim to keep myself fit as I do not want to burden others. Be it, doubling farmers' income by the year 2022, or easy accessibility of urea, the government is working on a dedicated plan. Replying to a question by Santosh Patil from Karnataka on how Bhagwan Basaveshwara has influenced him, PM Modi says Basaveshwara dedicated his entire life to work for democracy, bringing communities together and women empowerment. 'He is an inspiration to all of us,' he says. Q. What are your expectations from 'Modicare'?We paid special attention to three things -- children's education, employment for young people and health care for the elderly. Be it a wellness center or preventive health care, we are working for the health of every Indian in the country. PM Modi says, 'I am like any common citizen'. Q. You are working hard but can you change the nation alone? I am like any common citizen. And, I also have drawbacks like normal people do. We have a million problems but we have a billion people who can solve them. There is a question on the surgical strikes from the audience. Look back at India's history. India has never desired anyone else's territory.During World War I and II we had no stake but our soldiers took part in the Wars. These were big sacrifices. Look at our role in UN Peacekeeping Forces. We believe in peace. But we will not tolerate those who like to export terror. We will give back strong answers and in the language they understand. Terrorism will never be accepted. We spoke to Pakistan to tell them that we did surgical strikes before disclosing the news to media. Q. We select a Government that works for us. You have tried to change systems, but my question is should all this not have been done earlier? During the freedom struggle, Mahatma Gandhi did something very different. He turned the freedom struggle into a mass movement. He told every person that whatever you are doing will contribute to India's freedom. Today the need of the hour is to make development a mass movement. Participative democracy makes good governance possible. Yes, people have more expectations from us because they know that we can deliver. People know that when they say something, the Government will listen and do it. Days of incremental change are over. Q. Yes work is happening, but still there is still some degree of impatience. What do you have to say to this? PM Modi says, "'Besabri' (impatience) is not a bad thing. If a person has a cycle, a person aspires a scooter. If a person has a scooter, a person aspires a car. It is natural to aspire. India is getting increasingly aspirational." Q . Your life began from a Railway Station, and you are coming to this programme from the Royal Palace. What do you have to say about your life journey, asks Prasoon Joshi to PM. Modi replies its the hard work of my countrymen that has brought me here. Prasoon Joshi speaking at the event at Central Hall Westminister in London. PM Modi takes the stage, will begin his address at Central Hall Westminister in London. Will answer questions asked by people from the Indian community. Earlier in the day, PM Modi and Theresa May vowed to strengthen cooperation to take decisive actions against globally-proscribed terrorists and terror entities to protect citizens, including Lashkar-e-Taiba (LeT), Jaish-e-Mohammad (JeM), Hizb-ul-Mujahideen, Haqqani Network, Al Qaeda, ISIS and their affiliates, the statement added. Earlier in the day, Modi held a meeting with his British counterpart Theresa May. More than a 1000 people are present at the venue. Modi will answer questions asked by people from the Indian community.